Albion travel to Anfield this afternoon for one of their toughest matches of the Premier League season. Liverpool, who beat Brighton 5-1 and 4-0 last season, have started the new season with victories over West Ham (4-0) and Crystal Palace (2-0). Sadio Mane is a man in form for the Reds with three goals in Liverpool's opening two league games, while summer signing Alisson has kept two successive clean sheets. Jordan Henderson, who has come on as a substitute in both games so far, is pushing for a first start of the season. Likely Liverpool line-up: Alisson; Alexander-Arnold, Gomez, van Dijk, Robertson; Henderson, Wijnaldum, Keita; Salah, Firmino, Mane. Subs (from): Milner, Lallana, Sturridge, Moreno, Mignolet, Shaqiri, Matip, Clyne. The Seagulls bounced back from their opening-day 2-0 loss at Watford with a 3-2 win over Manchester United last weekend. Albion defender Lewis Dunk is likely to miss the game with the ankle injury he sustained in last week's victory. 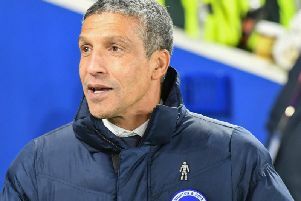 Leon Balogun came on to replace Dunk after 20 minutes against United and apart from that one change, the Seagulls are likely to start with the same line-up they fielded against Manchester United. Florin Andone, Jose Izquierdo and Bruno have all been ruled out.